These slides are from our 2016 national conference, A Nation That Works: What's It Going to Take? The Temporary Assistance for Needy Families (TANF) program has been one of the most studied, evaluated, and debated pieces of American public policy of the last 20 years. TANF has raised important questions and concerns about the role of the safety net in the lives of poor, single female heads of household. On a national scale, and in localities across the country, program designers, implementers, advocates, researchers, and thought leaders have been at odds with the program's multiple—and often times conflicting—goals. Participants are invited to join a discussion session that takes a look back at the last twenty years of TANF implementation and what we have learned, what is happening now, and what advocates and others are thinking about the future of safety net policy and supporting pathways to work and opportunity for low-income female heads of household. Copyright 2016 Heartland Alliance's National Initiatives on Poverty & Economic Opportunity. 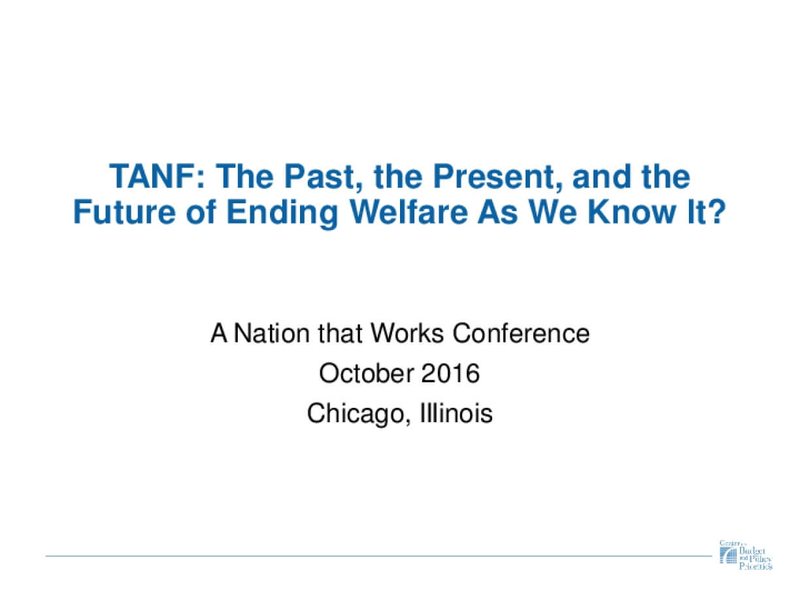 Title: TANF: The Past, the Present, and the Future of Ending Welfare As We Know It?